The cybersecurity company's strategy stopped working, leading to sluggish growth and a major layoff. Once a high-flying Wall Street darling, cybersecurity company FireEye (NASDAQ:FEYE) has treated investors to a walloping this year. The stock is down 40% year to date and down 87% from its post-IPO peak in 2014. Chronic losses in the past had been balanced out by impressive revenue growth. But with growth slowing dramatically in 2016, investors are no longer willing to turn a blind eye. The transformation from an innovative growth company to one laying off employees in an effort to achieve "balanced growth with profitability" is FireEye's biggest failure in 2016. FireEye was growing at a triple-digit rate in late 2014. That kind of growth gets harder as a company gets bigger, but FireEye was still producing impressive growth at the end of 2015. The company managed to grow revenue by 45% year over year during the third quarter of last year. Since then, however, things have slowed way down. FEYE revenue (quarterly year-over-year growth) data by YCharts. It better, because FireEye is still wildly unprofitable. The company has posted a GAAP net loss of $419 million through the first nine months of 2016 on just $529 million of revenue. Faced with the prospect of slower growth, FireEye announced a significant workforce reduction in August. Around 300 to 400 of FireEye's 3,400 positions were slated for elimination, and along with other cost-cutting measures, the company managed to reduce its total expense base by $10 million in the third quarter. FireEye expects to reach non-GAAP profitability in the fourth quarter of 2017, but GAAP profitability is still a distant prospect. Stock-based compensation, which is backed out of FireEye's non-GAAP figures, totaled $168 million through the first nine months of the year. It will take a lot more cost cutting and more growth for FireEye to produce real profits. FireEye announced a few new products in November, including Cloud MVX and MVX Smart Grid, but it's unclear exactly how the company plans to reignite growth after laying off 10% of its workforce. Investors expecting a quick turnaround from FireEye may want to hedge their bets. An analyst from Piper Jaffray met with security consultants and resellers earlier this month, attempting to gauge demand for products from different companies. While resellers were generally positive about companies like Palo Alto, Symantec, and Proofpoint, FireEye was a different story. According to the resellers, "Demand for FireEye has gotten worse and they are no longer leading with FireEye products for advanced threat protection." The cybersecurity market is extremely fragmented. According to Cisco Systems, which generates around $2 billion annually from its security business, the average large organization deals with more than 54 different security vendors. As the industry consolidates, companies like Cisco that offer a broad set of security products may fare better than companies like FireEye that have a more narrow focus. 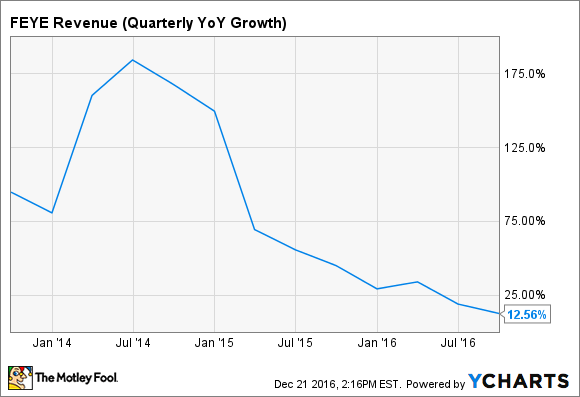 FireEye is in a tough spot going into 2017. It's strategy, which was successful in the past, is no longer working. Layoffs will help trim costs, but the company can't cut its way to profitability. Growth needs to return in a big way in 2017, reversing the company's failures this year. Based on what resellers are saying, that will be easier said than done.